Our history, I never forget it... But I recognize that if I had a little more of the Spirit of the Lord, and if I was full with that faith and virtue with which our fore-fathers have operated, I would be more up to the task of writing about their glories. Pray to the One who is the only author of the works of edification, that He may make me able, or find one who can write it; but more than ever pray that I may copy first of all in myself those virtues whose form up to now has been impressed in my soul only in a sterile way, so that I may express it for others in vivid colors and with features which have blood and movement. - 1567 Father JEROME MARTA (1499-1567), 4th Superior General. - 1501 Wedding of Lazzaro Zaccaria and Antonia Pescaroli, Anthony Mary’s parents. - 1631 Father JULIUS CAVALCANI (1567-1631), 16th Superior General. - 1849 In Gaeta, Pius IX proclaims the heroicity of the virtues of St. Anthony M. Zaccaria. - 1972 Father EXPEDITO MACHADO (1911-1972). Educated by venerable Fathers like Fr. Billman and Fr. Carugo, he was an apostle in the confessional, among the sick and the poor in St. Paul’s in Copacabana (Rio de Janeiro), as pastor of Our Lady of Nazaré in Belém, and as rector of the seminary in Caxambù. In the last years of his life he offered his many pains together with the daily Rosary for vocations and for the Congregation. - 1569 Father FRANCIS DA LECCO (1498-1569). Together with the three co-founders and Fr. De Caseis he was one of the first five members of the Congregation. - 1905 Father ALEXANDER BARAVELLI (1827-1905), 60th Superior General. -1847 Bishop STANISLAUS TOMBA (1781-1847), Bishop of Forlì, and Archbishop of Camerino. - 1595 Father TIMOTHY FACCIARD1 (1529-1595), 8th Superior General. - 1905 Father TIMOTHY BERTELLI (1826-1905), Scientist, inventor of the seismographer. He identified the exact burial site of the Holy Founder. - 1875 Father FRANCIS CACCIA (1806-1875), 56th Superior General. - 1597 Brother DIONISIUS CALCATERRA (1547-1597), one of the first Brothers in the Congregation, and the first to be buried in the new sepulcher of St. Vincent’s in Cremona. - 1663 Bishop JOHN BAPTIST PAGGI (1615-1663), Bishop of Brugnato. - 1557 Father FAUSTINUS PREMOLI (1690-1757), he dedicated his life to spread the devotion to the Holy Founder. The miracle of the lily happened in his hands in Crema. - 1933 Pius XI sent an Apostolic Letter to the Congregation for the celebration of the 400th Anniversary of its approval. - 1629 Father LAWRENCE BINAGHI (1556-1584), Priest and architect; he designed the church of St. Alexander in Milan. - 1913 Father CAJETAN OGGIONI (1825-1913), a pupil of Fr. Villoresi’s school in Monza, he became a Barnabite and dedicated his life to spiritual direction in our schools and to our seminarians, and as retreat master for the Clergy. - 1584 Father PAUL OMODEI (1522-1584), 7th Superior General, son of Bernardo and Laura Omodei. - 1857 Father JEROME BONOLA (1780-1857), Latin poet and teacher. - 1544 The Countess Paola (Ludovica) Torelli inaugurates the Paulines’ mission at Ss. John and Paul hospital in Venice. - 1745 Father JOHN JEROME GAZZONI (1670-1745), 35th Superior General. - 1763 Father PIUS GALLIZIA (1735-1763), together with Fr. Donati he reached Burma to continue the missionary work of his uncle killed 15 years before as Apostolic Vicar. - 1788 Father SEBASTIAN COLOME (1712-1788), author of moral, ascetical and biblical works. - 1955 Brother PETER BINOTTI (1877-1955), a very wise and strong personality, for more than thirty years worked in Our Lady of Nazaré in Belém (Brazil). - 1688 Father ROMULUS MARCHELLI (1610-1688), 23rd Superior General. - 1748 Father CHARLES AUGUSTINE CAPITAIN (1665-1748), 33rd Superior General. - 1819 Father EMERIGO BRUCCO (1734-819), 46th Superior General. - 1567 Father JOHN JOSEPH CAIMO (1502-1567), one of the first members of the Congregation. - 1568 Death of Bernardo Zaccaria, cousin of St. Anthony M. Zaccaria. - 1672 Father GIOVENALE FALCONIO (1593-1672), 19th Superior General. - 1951 Father ARISTIDE PANIGADA (1869-1951), a very sensitive man, he dedicated himself to the sick, the poor, the prisoners, the orphans and the old. - 1533 In Bologna, Clement VII with the Breve “Vota per quae nos” canonically approves our Congregation. It is the legal birthday of the Order in the life of the Church, although it had started in 1530. - 1529 Priestly ordination of St. Anthony M. Zaccaria in Cremona. - 1601 Father DOMINIC BOERIO (1548-1601), Defender of the faith in Valtellina. - 1970 Father PETER DECUYPERE (1890-1970), in Brazil, he dedicated himself to the salvation of souls, and the formation of our novices. - 1551 Ban of the Paulines from all Venetian territories, where they had been working for 15 years. - 1549 Paul III approves the foundation of the Angelics’ Monastery of St. Martha in Cremona. - 1944 Father JOHN BAPTIST SPOTORNO (1788-1844), he excelled in many of the human sciences as well as in spiritual life. - 1670 Father MAURICE MARIN (1595-1670), one of the first vocations from Savoy. He promoted the canonization of St. Francis de Sales. - 1768 Father JOHN PETER BESOZZI, III (1708-1768), 41st Superior General. - 1857 Pius IX proclaims the heroicity of virtues for St. Francis Xavier M. Bianchi. - 1961 Father ACHILLE DESBUQUOIT (1874-1961), a man of culture, very practical in everyday living, a leader in government, for many years, through preaching and writing, he promoted the teaching and the spirit of St Paul. - 1990 Father ARTURO PIOMBINO, a master of spirituality; adviser of the Venerable Brother Teodoreto of the Christian Brothers. - 1597 Mother PAOLA TIMOTEA (VIENNA) DATI, she had been the wife of Father Gianpietro Besozzi; she joined the Angelics in 1543. - 1801 Father ANGEL CORTENOVIS (1727-1801), scholar, historian and archeologist, he kept in contact with many of the scholars of his time. He practiced humility to an extreme, and dedicated himself to the confessional. His “Familiar letters” are still a source of precious and edifying information. - 1536 THE PROFESSION OF THE FIRST ANGELICS: Paola Antonia Negri, Domenica Battista da Sesto and four other Angelics receive the habit from St. Anthony M. Zaccaria. - 1918 Father MAURICE GIRARDIN (1866-1918), Very active in the Brazilian Province. - 1584 Father PAUL MALETTA (1529-1584), Friend of St. Charles and St. Philip Neri, worked for the reformation of the Humiliati, and Gregory XIII sent him to Malta for the reformation of the Knights. 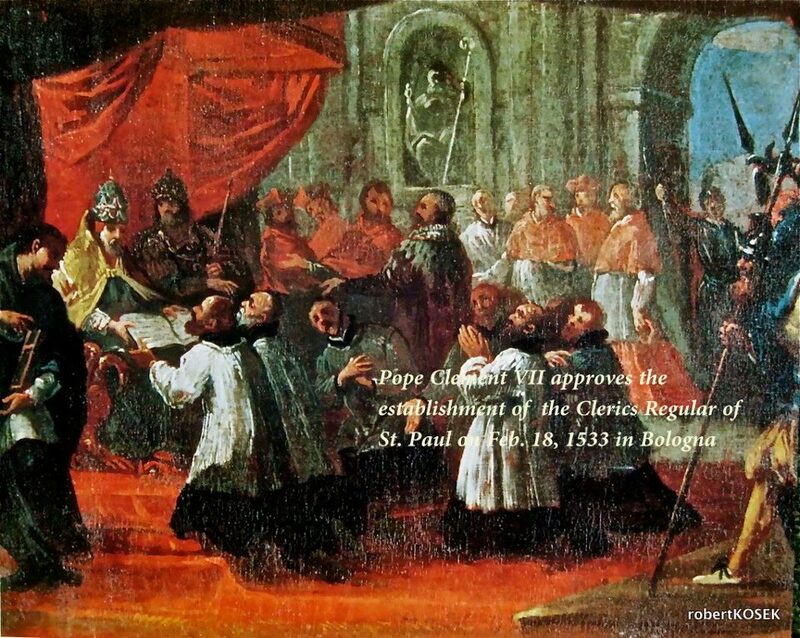 On Saturday, May 17, 1551, the Vigil of Pentecost, Fr. Marta and the Barnabite community of St. Barnabias in Milan received the young Alexander Sauli into the Barnabite Order to carry a large cross through the streets of Milan. It was Fr. Marta, who placed it on Alexander Sauli's shoulders. For many years, Fr. Marta had governed the Congregation as Superior General during the difficult times following the expulsion of the Barnabites from the Venetian Republic. Fr. 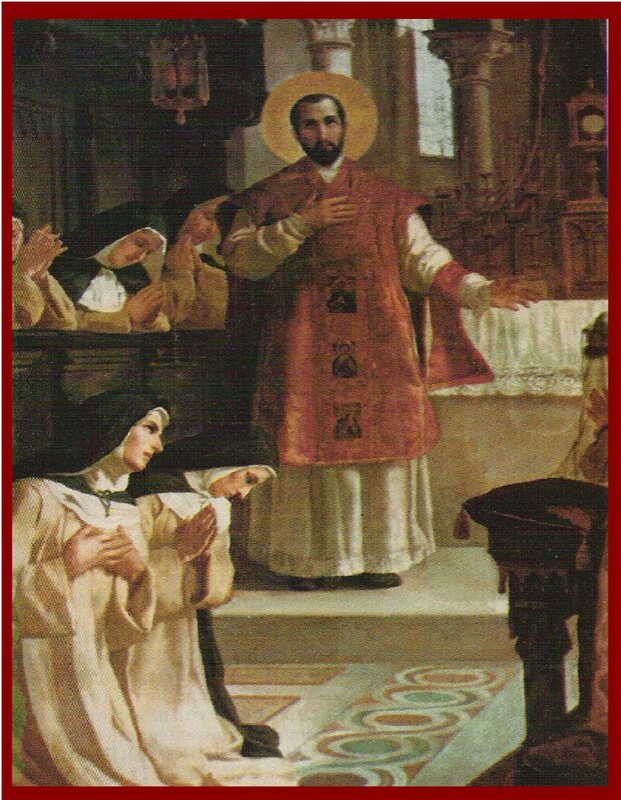 Marta died in St. Barnabas (Milan) on February 1, 1567, assisted by the Venerable Fr. Besozzi, with whom he had shared both pains and joys. Julius was ordained a priest in 1594 and spent the first seventeen years of his priesthood as a well known preacher. In 1611 he was nomi­nated Superior of the Community in Cremona composed then of 40 mem­bers with a flourishing school of rhetoric and philosophy. He was also director of the convent of the Angelics and Bishop Brivio of Cremona, used him widely as a preacher. In 1614 he was elected Provin­cial Superior of the Province. Fr. Spinola describes his program as follows: “He loved, without doubt, to be reserved and modest. He loved silence and the choir, but he could not accept that a Religion whose purpose and aim is to serve people, would be restrained with the excuse of recollection.” With the permission of the local ecclesiastical authority he promoted missions and spiritual assistance to the people of Ostia, Port Albano, Palestrina, and Sabina. Often the Cardinals would take him as a companion on the canonical visitation. For the first time, under his government, our Fathers were called to be penitentiaries in St. Peter’s basilica. In 1623 he was called to govern the whole Congregation. His first concern was to provide a proper education for the Barnabite students. For this purpose he selected the best teachers among the Fathers, setting them free from any other responsibility. To make sure that the Constitutions were observed, he made unscheduled visits to the various Communities, reprimanding the disobedient and encouraging the faithful ones. He was resolute in his commands and requested prompt obedience with a strong deter­mination in his decisions. In Italy he founded the communities in Chieri, St. Bridget in Piacenza, St. Fredian in Pisa, St. Charles in Arpino. He brought to conclusion the foundation of the Annunciation in Peseia through the union with a local Congregation of priests. He also successfully accomplished the opening of St. Sebastian in Livorno. Through Cardinal Buoncompagni, Archbishop of Naples, the Barnabites were admitted to the Cathedral penitentiary. He also started the foundation of St. Charles in Mantua, to be finalized after the 1630 plague. In that year the General Chapter was held in Pavia, and Fr. Cavalcani was again elected Superior General at the death of Fr. Torriani. He moved to St. Barnabas to be able to better guide the Congregation during those troubled times. He was able to inflame with such a zeal his sons in the assistance to the victims of the plague that it is impossible to describe how much it was accomplished. 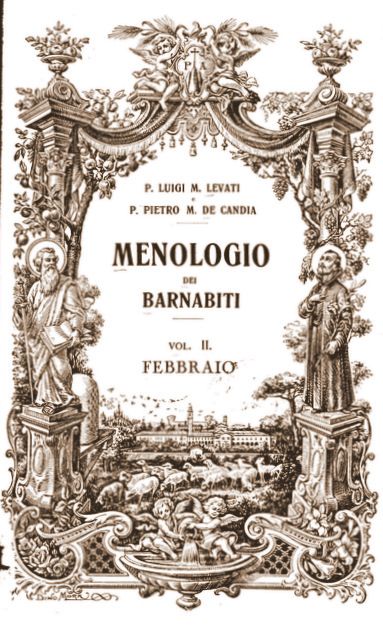 In Lombardy over 100 Barnabites lost their life in the service of the victims. He used letters to reach the confreres, and he was always ready to send substitutes for those who were falling on the field of the apostolate. Sending out the news of those falling he would use beautiful praises to enthuse others to work with the same enthusiasm. Only in September, totally drained, and since the plague had almost ceased, he went to Zuccone, in Brianza, together with the students and novices. On his way back to Milan he was exhausted and heartbroken to see the Congregation decimated by the plague. One of the first followers of the Holy Founder was Fr. Francis da Leceo. We are not sure about his birthday. We know for sure that in 1534, having renounced the Canonical rights of Desio, he joined Anthony Mary, full of enthusiasm to cooperate in the religious reform started by the Saint. But at the end of the year he had to go back home due to a serious sickness: “The priest Francis da Lecco, a very honorable man, had been called by the Lord among the first members of our Congregation, but on December 28, the day of the Holy Innocents, 1534, he had to leave for home, due to a grave illness” (Cronachetta). After eight years, having been healed, he was able to come back in the Order. Fr. Spinola wrote: “As Fr. Francis came back to the regular quiet of St. Barnabas, he gave himself totally to the perfect observance of the new Constitutions. Faithful to the choir, ready to obey, also in the most menial jobs in the house, and often reflecting that with the holy vows, done in private, he had dedi­cated himself to God, he decided to do it in public so as to be committed more than ever to serve the Divine Majesty. And so on May 30, 1555, in a public Chapter, he petitioned in mercy to be admitted to the Holy Profession. Having presented the same petition the following day, the day after and on June 3, with signs of singular humility, he received the grace by all the Fathers gathered in Chapter, and on June 4 he made his solemn profession in the hands of Fr. Besozzi, then Superior, who, knowing well the virtue of Fr. Francis, named him Prefect of the Congregation of the Espoused.” We still have the original paper with his profession. The simple words “he was a saint” summarize Fr. Baravelli’s whole life. Gifted with a deep knowl­edge of men and of the world and with spiritual discernment, Fr. Baravelli was able to assess and resolve the most intricate and most delicate situations, at the same time he never lost a childlike attitude. There­fore, in order to appreciate him, a close intimate knowledge is needed. At first sight, he would inspire deep reverence along with discre­tion. It was easy to become close to him as he was always ready to be a friend and a confidant. This kind of dichotomy between his exterior ap­pearance and his interior reality constituted the special physiognomy of Fr. Baravelli. He taught philosophy and theology in Rome, in Milan and in Paris. A member of many academies, he never bragged about it. In Rome, as his ability for work was appreciated, in 1887 he was nominated consultor to the Congregation of the Sacred Rites, censor for the cases of conscience and member of the Liturgy Commission. If it were not for news provided from the outside world we would have never known many of his accomplishments. He had an open mind but he was so impenetrable regarding his honors. He had a great spirit of mortification, limiting himself to the essential things, but he had also a great community spirit, always caring and very much active. In his long life he never lost his serene gentleness, although he had to face so many difficult and terrible moments. He was always ready to open his heart to anyone and to alleviate their pains drawing his strength from a fervent and constant prayer life. In the Congregation he was entrusted with the formation of the novices and the professed students in St. Barnabas, in Paris, and in Rome. He was superior in St. Charles ai Catinari in 1867, and Assistant General until 1877 when he was called to lead the Congregation as Superior General for twelve years. In his government he did not use his authority but his persuasive meekness and personal example. He was a great educator of the young in Naples, Aosta, Bologna, Milan, Paris, Rome, and most especially at the oratorio of the Sacred Heart, which he created in 1880 and directed for 25 years. He knew how to love the youth and so he succeeded in his education efforts. As he advanced in age his thoughts were always for the Congregation and his young people. In peace he gave his soul to God on February 3, 1905, at the age of 78. The life of Bishop Stanislaus Tomba was written by Father G. Albini. Stanislaus was born in Bolo­gna in 1781. He became well known for his zeal for God’s glory, the salvation of souls, and for his total dedication, as bishop, to inculcate and develop among his clergy the best virtues together with a deep academic knowledge. He introduced in his seminary new courses and fields of study. While Bishop of Forlì, he did rebuilt the cathedral church, and established the society of the “Dorotheans,” a group of trustworthy ladies dedicated to the education and assistance of poor girls, who were easy victims of vice. During his twelve years as a Barnabite in Bologna, he organized a society to assist the people in jail, and a group of rich people to assist the sick, with the stipulation that if they could not give of their time they were committed to financial assistance. He himself became victim of calumnies, but Bishop Tomba “with that spirit which wins all battles,” kept pursuing the good in the development of his duties. He had a solid foundation in his studies and, while in Bologna, he became a member of the “Philosophical College” and gave many philosophical lectures in our school of Santa Lucia in Bologna. He was Bishop of Forlì and archbishop of Camerino until 1847. He died as a saint. At his deathbed, the Friar Minor Joseph of Tolentino knelt to pray for his intercession in heaven. Greater homage was given him by the people of his dioceses, which unanimously called him a saint. Finally the grace of God struck his heart through a saint, who in a little corner of Pavia was drawing people to God. Timothy started to visit the church of St. Mary’s at Canepanova run by the Barnabite Fathers. There he met St. Alexander Sauli. He was 38 years old then, sick looking and often victim of high fever. He asked to enter the Congregation but to be refused. He persisted. Meantime, with God’s help, his health improved and some years later he was accepted. St. Alexander Sauli received his vows in Milan on Christmas night of 1567. He wanted to “live in isolation, away from any noise, to be able to recuperate through penance and self-denial, so much time lost during his youth.” But his dreams were shattered when, by vow of obedience, he had to become a priest and was assigned to the confessional, and later, at the request of St. Charles Borromeo, he was appointed director of the Arona Seminary “with great satisfaction of St. Charles and the Clergy.” He lasted in this position until a General Chapter forbade the Barnabites to be involved in the direction of seminaries. He was one of the Fathers involved in the founding of the novitiate of Our Lady of Carrobiolo in Monza. In 1576 he was elected Superior General, although he had not been a member of the Congrega­tion for the prescribed ten years. Among the many things he accomplished as Superior General we will mention only his efforts to curb the abuses of freedom by some members, but especially the easiness with which some of them were moving from one Congregation to another. He stopped this abuse through a Bull of Pope Gregory XIII. He sent some Barnabites to help St. Alexander Sauli in Corsica. During his time he had to coordinate the assistance to the victims of the plague, and to organize prayers and penances to invoke God’s mercy. St. Charles was of great comfort and help to him. They used to meet regularly in St. Barnabas. At the end of his term, he went to Monza as Master of novices. In the General Chapter of 1579 he asked to be allowed to retire to private life, but St. Charles, who was present as apostolic delegate for the approval of the Constitutions, persuaded the Capitular Fathers not to deprive themselves of “such a man so prudent, humble and zealous for singular discipline.” He was elected Visitor and Superior in Cremona. But the next year, because of his poor health, his request was granted and he went back to Pavia. He was born in Bologna on October 26,1826, and was baptized with the name Leopold. His parents were Francis Bertelli, professor of astronomy at the University of Bologna, and Teresa Palloti. When he gradu­ated from our school of Santa Lucia in Bologna he asked to be admitted into the Order. He professed his vows at St. Bartholomew in Genoa on September 7, 1845. He studied theology in Rome and, in 1848 he was assigned to the brand new school of the Royal Carlo Alberto in Moncalieri, a gift to the Barnabites from the King, Carlo Alberto. From then on, for over half a century, Fr. Bertelli was dedicated to the teaching of mathematics and physics in Naples, where he was or­dained a priest on October 25, 1850; at St. Philip Macerata; in Bologna; in Parma; in Naples again; and finally in Florence in 1868, at the new school Alla Querce, founded by Fr. Louis Cacciari. He distinguished himself for his studies and discov­eries, especially in the field of microseismic movements of the earth. The Barnabites owe to him special appreciation because it was through his studies and intuition that they were able to locate the body of the Holy Founder, St. Anthony M. Zaccaria, in May 1891, in the crypt of St. Paul’s, the church of the Angelic Sisters in Milan. He did hold many different positions in the congregation: Superior in Rome, Assistant and Vicar General, and in 1895 he was, if not officially, practically the director of the Vatican Observatory, and president of the academy of the “Nuovi Lincei.” Back in Florence, suffering severely with his lungs, he died on February 6, 1905, at the age of 78. Francis Caccia entered the Congregation when he was a law student at the University of Turin. At the end of his theological studies he was assigned to Finalmarina, and then to Vercelli to teach philosophy in the public schools. Six years later, he moved to Livorno to teach theology. Because of his knowledge in the sacred sciences, the Bishop appointed him synodal examiner and judge of “cases of conscience.” During the General Chapter held in Rome in 1844, he was elected Provincial Superior in Piedmont, He had great zeal and plenty of activities nourished under his leadership. One painful decision he had to make was the closing of the public school in Vercelli and in Finalmarina because of lack of funds. At the end of his term, in the General Chapter of 1847, he was elected Superior General. Among his other accomplishments we should mention the opening of a new house in Teramo, the novitiate in Resina (Naples), and a house of studies in Macerata. In 1852 he tried to open a house in France, the first time after the Napoleonic suppression. He was Superior General for a second term from 1856 to 1867, when the Congregation had to accept his resignation after he had obtained from the Vatican a Breve stating that he could not be obliged to receive honorific positions. The year after, 1867, he helped a new foundation in Florence and then moved to St. Paul in Paris, where in 1870, he was elected provincial Vicar. He occupied his time between the confessional and the classroom teaching mathematics, canon law, and moral theology to our seminarians. During the terrible times of the “Commune” he did not want to leave the community in Paris. He became a living witness of the gospel and an inspiration for the rest of the community. He died suddenly right after the celebration of the Mass, on the morning of February 7, 1875, after having gone to confession. He was 68. Philosopher and theologian, preacher and scholar, historian and contractor of public works, as well as pious, religious and zealous Bishop, this is the figure of the Barnabite Bishop John Baptist Paggi. Born in Genoa on June 10, 1615, he received from his father, a modest painter, genius and cheerfulness; from his mother, generosity and gentleness. He started his studies in Genoa and finished them in Perugia. While working on his master degree, he decided to become a religious. He professed the vows in Zagarolo, was in Milan for philosophy, in Macerata for theology, and was ordained a priest in the fall of 1641. His first public assignment was in the Asti public school. This school was in bad shape because of the pestilence and the war which had destroyed most of the city. Through his efforts the school reopened its doors and he gave the inaugural address. Besides teaching, he excelled in preaching. Pazzi affirms that Fr. Paggi transmitted St. Paul’s spirit and was moving the hearts of the people. He was requested in all of Piedmont, even by the Duke of Savoy, Charles Emmanuel II, who asked him to preach in Turin on the Holy Shroud, and his homily merited to be published. Bishop Broglia of Asti, invited him to give the opening speech at the diocesan synod, and then named him synodal examiner and special visitor for some areas of his diocese. In the Congregation he was asked to hold positions of responsibility: at 31 he was Superior in Asti; he was sent to Genoa to resolve a delicate situation with our Community of St. Paul in Campetto; he was Superior of St. Paul alla Colonna in Rome; for three years he was member of the Community of St. Blaise and then was elected Provincial Superior of the Roman Province. While in this position he was elected Bishop of Brugnato in Liguria, and he was consecrated a Bishop on June 24, 1655. The small diocese with only 33 parishes was situated up in the mountains and was very poor, sharing the borders with many states. This made it an ideal hiding place for bandits and the constant subject of litigations to preserve its immunity and protect the rights of the church. Through Bishop Paggi’s interven­tion, many factions that were on the war path, and often bloody ones, reached reconciliation and peace. He was instrumental not only in the rebuilding of the cathedral church, but also of the only bridge on the river Vara, which had been closed for many years. The Republic of Genoa asked him to be its historian, but, caught by premature death, he could only finish the “Annales” he had started. Aware of his coming death, he asked Father General Cuttica to have the spiritual assistance of Father da Passano, a Franciscan, to his very end. He died on February 18, 1663. Fr. Augustine Premoli was the man sent by God to revive the devotion to St. Anthony M. Zaccaria, after it had faded away because of the decree of Urban VIII. We Barnabites owe him a lot, because it was through his love and persistence that the development of faith and devotion to the Holy Founder was restored in Crema and led to his canonization. James Philip Premoli was born in Crema, son of the count Paul and the Countess Teresa Griffoni Santangeli, on May 1, 1690. On October 25, 1705, at the age of 15, he entered the novitiate in Monza and took the name Faustino. He finished his studies at St. Alexander in Milan, where he was ordained a priest. His first assignment was at St. Marino in Crema. He had a deep devotion for our Holy Founder. Under his spiritual guidance a lady, paralyzed for years, made a novena to the Blessed Anthony M. Zaccaria. On July 5, at the conclusion of the novena, after receiv­ing holy communion, she was instantly cured. This miracle steered up renewed enthusiasm among the people and strengthened the devotion and determination of Fr. Premoli. “He would go, almost everyday, door to door, to bring any sick person the blessing of the Blessed; therefore, the room in the residence where the picture of the Blessed was exposed, was always full of devotees coming to thank him for favors received. He died on February 8, 1757. The funeral was a triumph with the participation of the whole city. Born in Milan in 1556, Father Binaghi entered our Congregation when he was very young, and professed his vows in 1574. His first assignment was in Casalmonferrato. Immediately he put at good use his skill as an architect building the church of St. Paul. Fourteen years later he was in Cremona to build the residence for the Fathers. Of his designs are also the novitiate in Zagarolo and the Church of St. Paul alla Colonna in Rome. It belongs to him also the church of St. Alexander in Milan. Fr. Oggioni was born on August 10, 1852 in Lecco, son of Francesco and Maria Confalonieri. After the secondary school in Lecco and in Celana, in 1869 he entered the Villoresi Seminary in Monza to study philosophy. He completed his theology studies in the major seminary of the diocese of Milan and was ordained a priest on May 23, 1875 by Bishop Calabiana, and celebrated his first Mass in the church of the Blessed Sacrament Sisters in Monza. For ten years, he was assistant pastor in Olate (Lecco) distinguishing himself especially for his preaching. In 1885 his family moved to Monza. He went along with them and became chaplain of the local orphanage, located close to our Carrobiolo church. He became very intimate with our fathers. Meantime his sister Gertrude entered the convent, while his father died of apoplexy. His mother, although advanced in age and blind, did not want to interfere in her son's religious vocation, therefore, she wanted to go to a nursing home in order to leave him free. The Fathers opposed this plan, and told him that if he wanted to become a Barnabite, first of all he would have to explicate his duties towards his mother. When in November 1892 she died, he was finally able to enter the novitiate, and he professed his vows on February 20, 1894. His first assignment was in Lodi as spiritual director of the boarding school. After his solemn profes­sion in 1896 he was transferred to Milan. There he distinguished himself for ten years as a confessor, spiritual director and retreat master, especially for the clergy. Cardinal Ferrari nominated him to the metropolitan penitentiary. In 1909, the superiors needed a superior and spiritual director for the minor seminary in Cremona and Fr. Oggioni was their choice. There too, Bishop Bonomelli, used the good father as the confessor for the diocesan seminary. Only two years later, he was called to be spiritual director of our college in Moncalieri. This transfer cost him a lot but he obeyed and worked with his usual enthusiasm. Unfortunately, he suddenly fell victim to pneumonia and died on February 10,1913. At age 16, Fabrizio Omodei was accepted into our congregation by St. Anthony Mary Zaccaria, only a few months before his death. He changed hid name to Paul Mary, professed the vows in 1547 and two years later he was ordained a priest. Because of his intelligence and knowledge, he served as secretary for Frs. Morigia and Ferrari at first, then, having shown a strong character, he ac­companied Fr. Besozzi and Fr. Sauli to Pavia for the Foundation of Our Lady in Canepanova. In 1560, Fr. Omodei was back in Milan in charge of the education of the young clerics, as master of novices, and as teacher of hu­manities and philosophy. When the students were moved to Pavia he went with them. In 1556, he was elected superior and vicar. One of his great cares was the teaching of catechism to young children. Four years later, although absent because of an illness, Fr. Omodei was elected Superior General in the General Chapter held in Milan. He succeeded Fr. Sauli who had become a bishop. Following the instructions of St. Alexander Sauli he revised the constitutions, abandoned the direction of seminaries and monasteries, and approved the deliberation to free the Superior General from being superior of the house. He opened new foundations in Cremona, Casalmonferrato, and the novitiate in Monza. He even made the first attempts to open houses in Rome and Vercelli. He kept for the Fathers the direction of the Angelic Sisters in Milan and in Cremona. He died on February 11, 1584 while he was an Assistant General and Superior of St. Barnabas. Fr. Spinola wrote: “His death was a disappointment for his confreres and for the laity, including the civic leaders, and the same St. Charles: the laity because they had lost a great spiritual director; the saint for having lost a valuable minister!” He died only a few months before St. Charles, and he was buried in St. Barnabas. Father Bonola was enriched by God with a serene spirit together with the gift of poetry. Born in Milan, he pursued the priesthood in an era when religion was ridiculed by modern society. In 1805, already a priest at 26, he decided to enter religious life. His first assignment was to teach literature in our schools, and then in St. Barnabas, theology to our seminarians. In 1810, with the Napoleonic suppression of all the Orders, Fr. Bonola went to Tuscany to teach Greek literature. He also became a tutor in the house of the Granduchy. With the reestablishment of the Roman Province he immediately reentered the Congregation. Since his youth, Father Gazzoni showed a great aptitude for studies. He had the honor to present a theology thesis in front of Cardinal Altieri and many prelates and religious. At first he taught rhetoric and philosophy at our school in Casale, which had just been entrusted to the Barnabites, and then theology in Bologna. There, in charge of the penitentiary, he had a very close relationship with Cardinal Lambertini (fu­ture Pope Benedict XIV) who entrusted him to write the rules for four different religious Congregations of Sisters in Rome. He was Provincial Superior of Etruria for two terms. From 1737 to 1741 he was Superior General. In 1738 he opened the house of St. Joseph in Serravalle (Veneto) with a public school. In 1742 he had the joy to witness the canonization of St. Alexander Sauli, and also the flourishing of our mission in Burma. Jean-Baptiste Colome was born on April 12, 1712 in Pau, the old capital of the Bearn in Southern France, from Amaud and Jeanne de Larueux. From his parents he received an education very open to any kind of religious and literary culture. He entered the Congregation in Lescar and received the habit on March 25, 1731, and professed the vows on April 2, of the following year in the hands of Fr. Henry de Batz, local Superior, taking the name of Sebastian. A very intelligent man, he was very dedicated in enriching himself with a vast culture for a better apostolic service in his ministry. He did his preparation to the priesthood in Lescar reaching the ordination in 1734. His first assignment was as rector and teacher of rhetoric at the boarding school of Sts. Paul and Charles college in Dax. There he built up a good reputation as a preacher. Next we find him in St. Eligious in Paris as confessor, catechist and preacher for the missions to the people in various cities in France, but he was also a prudent spiritual director and dedicated to help the poor. On May 2, 1752 the General Chapter nominated him Superior of St. Ludovic in Montargis, where he distinguished himself for his prudence and sweetness in his government, zeal for regular observance, and ardor in the service to the people. He did build a true Christian community through religious services, religious instruction, confessions, retreats for the youth, and missions. He held the position until September 1756 when he was freed from community responsibilities. On April 27, 1769 he returned to Paris as Superior to be elected Provincial by the General Chapter of the following year. The Archbishop of Paris, Christophe de Beaumont, named him visitor for the St. Ursula Convent. In the General Chapter of 1773 he was freed from his task but to be made General Visitor for France until 1776, and again from May 4, 1779 to May 1782. Then he was consultor for the Province, and on May 16, 1783 again Superior of St. Eligious and will remain in that position until his death, on February 14, 1778, at the age of 76. What made Fr. Colome popular in France were his publications, especially the two volumes “Christian Life, or principles of Wisdom,” very similar to the “Imitation of Christ” (Paris 1774). Fr. Remolo Marchelli had three gifts: virtue, knowledge and eloquence. His only aim was to give glory to God and the salvation of souls. His Lenten homilies had to be reprinted so many times that in 1689 one publisher in Bologna, exclaimed: “With his applause he has tired fame, and in his praises he has made poor the most gifted tongues.” They were translated even in Spanish. He preached from the famous pulpits of Milan, Venice, Turin, Genoa, Rome, admired by the nobles as well as the common people. Fr. Marchelli was born in Rossiglione in 1610. In 1627 he received the Barnabite habit in Monza. At the end of his studies he taught philosophy at the Archimboldi school in Milan, but only for short period be­cause he discovered that his vocation was the pulpit. He was Superior of St. Charles in Campetto, Genoa, and he distinguished himself for the assistance to the sick when the city, in 1657, was afflicted by a contagious disease. It was through his efforts that the church of St. Bartholomew of the Armenians, in Genoa, was en­trusted to the care of the Barnabites, and the one of St. Paul in Acqui was preserved (it would had been suppressed by a general decree promulgated by Innocent X suppressing all small monasteries). Fr. Marchelli was the first Superior General nominated by the Pope in 1666, because of the particular circumstances caused by the death of Fr. Cuttica shortly after the opening of the General Chapter. He opened two houses in Bologna and in Rome, and Our Lady of the People in Parma. At the end of his term (8 years) he stayed in Rome for another three years as Assistant General, and then went to Genoa at the Novitiate of St. Bartholomew to spend the rest of his life. He died on February 15, 1688. Father Capitain was born in Paris in 1655 of Charles and Frances de Bonigatle. He entered reli­gious life and professed his vows in St. Eligius, Paris, on November 6, 1684, changing his name Anthony to Charles Augustine. Because of his intelligence he was elected to go to Rome for his studies. Back to France he dedicated himself to the teaching of Philosophy and to preaching. In 1701 the Fre nch Province was established and Fr. Capitain was elected its Provincial Superior for three consecutive terms. In 1702 he was named director of Dax diocesan Seminary. In 1710 he concluded the foundation of St. Gratus Oleron, with a small seminary attached to the house. While Provincial Superior, Father Capitain was able to lead his confreres against Jansenism, which at that time was dominating religious life in France. He was so successful that Clement XI, in a public meeting of all the Procurators Gen­eral, praised the Barnabites of France for their prompt adherence to the Bull “Unigenitus” against Jansenism, while other religious had rebelled following Car­dinal Noailles. Fr. Capitain’s reputation spread also in Italy and in the Chapter of 1725 he was elected Superior General. Unfortunately politics during that time disrupted the peace of the Congregation. Two Cardinals, de Polignac in favor of France, and Cianfuegas in favor of the Emperor, tried to influence the Chapter causing such an upheaval among the Capitular Fathers that the sessions had to be interrupted. To resolve the problem Clement XIII delegated as president of the Chapter Cardinal Marefoschi. Having convinced members of the Lombard province, the Chapter elected Fr. Capitain as General, in favor of the French faction. The election was well received by the Capitular Fathers, but not by the Emperor. As a penalty the Provincial Superior of Lombardy, Fr Reseghini, the visitor, Fr. Carminati, and Fr. Agliodolce were banned from the Duchy of Milan by Cardinal Cianfuegas. Fr. Capitain right away wrote a pastoral letter to heal the wounds, expressing his horror at the interference of external forces in the personal business of the Congregation. After a year and half peace came back in the Con­gregation when Cardinal Cianfuegas lifted the prohibition and Fr. Provincial was able to go back to Milan. Fr. General took advantage of the new freedom for a Pastoral visit to all the communities, and first of all to the one of St. Barnabas in Milan. Fr. Capitain was unanimously reelected Superior General. Meantime the Duke of Savoy had for­bidden religious orders to have schools in his territory forcing Fr. Capitain to transfer many of his Reli­gious from Savoy to France. During his government he rebuilt many houses and refurnished them so that religious would not need to go out for recreation or for relaxation. In 1726 he obtained from the Holy See many privileges, like the office of the Immaculate Conception on Saturdays, the patronage of St. Joseph on the third Sunday after Pentecost, and the privileged altar for masses celebrated for the deceased Barnabites. In 1727, Fr. Capitain obtained a Breve to forbid the use of the beard. He also consoli­dated and enlarged the foundation in Udine. He was greatly praised for his intelligence, his equity, his constancy, and most of all for his prudence and for his love for the Congregation. He passed his last years in France where he died on February 15, 1748, at the age of 83. Unfortunately, because Fr. Brucco died in 1819 during the period of the Napoleonic suppression of the Order, we do not have a biographical sketch of his life, or any information on him from the acts of the Communities. Only few things are known about him. He was born in Turin on July 1, 1734, from a noble family. His father was John Paul Brucco-Olivera, Count of Sordevolo; the mother was the Countess Bartolomea Ferrari. His baptismal name was Joseph. He entered the novitiate in Monza and received the habit on October 16, 1753 from Fr. Olivazzi, Provincial Superior of Lombardy, and changed his name to Emerico. The newly professed pursued his philosophical studies at St. Alexander in Milan and theology at St. Charles ai Catinari in Rome. He was ordained a priest in the fall of 1759. Fr. Brucco stayed in Rome for fifty years, until the Napoleonic suppression of May, 1810. One of his major tasks was the teaching of Sacred Scripture every Sunday, after Vespers, in our Church. At the age of 35 he was elected Assistant General, a position he held for nine years. He then went to St. Charles as Superior. In 1788 he was Assistant again. In the General Chapter of 1789, held in Bologna, following the death of Fr. Paul Scatti, Fr. Brucco was elected Superior General. This election was received with great joy by the king of Sardinia since Fr. Brucco was a member of that kingdom. Fr. Brucco’s first concern was to send missionaries in Burma, but his efforts were frustrated by the events: political intrigues, difficulties to admit novices to the vows, and the closing of some houses. The French revolution suppressed the flourishing French Province, and in 1792 all the Barnabites were ex­pelled from Savoy; the houses of Annecy, Thonon and Bouneville were closed. Meantime by the decree of the government, Fr. General was deprived of his juridical power in the Napoleonic Province. In 1794, at the end of his term, Fr. Brucco remained in Rome until 1810 when the Napoleonic decree suppressed all the Religious Orders. He found refuge with his family in Turin where he died on February 15, 1819. Father Caimo was born in Milan in 1502. His noble family provided a good education for him and sent him to Rome to look for a prestigious career. He became well known for his “prudence and knowl­edge,” therefore Cardinal Frederic Cei entrusted him with some delicate and important tasks in Milan and Vicenza. While in Vicenza he took few days to relax, and started to attend the church of the Barnabites. Touched by their preaching he decided to ask for admission. He received the habit at the age of 42 on September 8, 1544. Since he already knew theology, three months later he was ordained a priest. This was the time when Antonia Paola Negri was controlling the Congregation. On April 25, 1548, in the Chapter, she deposed the Superiors that she did not like, and among them Fr. Caimo, because “he had never wanted to do his job with love and charity.” With great humility the good religious accepted the decision and even a public rebuff by her. Not long after, the community of Cremona asked for a director of their church, and Fr. Caimo was sent. Two years later in the General Chapter of 1550, it was decided that since the Superior was too busy to run the Congregation, he should be free from the direction of the convent of the Angelics, and instead to appoint a spiritual director for them. The task was entrusted to Fr. Caimo. In 1565 because of illness, including blindness, he went to St. Barnabas where he died on February 16, 1567. Father Falconio was born in Rome in 1593, and was baptized with the name Ferdinand. He studied at the Roman college under the direction of Fr. Famiano Strada. When he was fifteen he entered the novitiate in Zagarolo and professed the vows on April 13, 1610. After his studies at St. Blaise in Rome he was sent to Cremona to teach philosophy. After a short period he got very sick and had to quit teaching. Looking for a better climate, he went to Vercelli where his holiness became well known, “they say there is at St. Christopher’s a religious in charge of the door who deserves to be superior and not at the door!” Indeed he was elected superior and he kept faith to his fame. Later, assigned as a Superior of our school in Pavia, he dedicated himself to the teaching of cat­echism, the care of the Oratorio, the cult and decor in the church, and the perfect observance in the house. In 1629 he was elected Visitor General, “so that the whole Congregation could benefit from the holiness of such a saint.” Three years later he was elected Assistant General and in the Chapter of 1638 Superior General. He was 45 years old and was confirmed in the office for two terms. At the end of his terms he was again Assistant General, and in 1653 they wanted him again as Superior General but he refused because of his health. He was an Assistant almost to the end of his life. During his term he visited all the communities of the Congregation. In Vienna he was warmly welcome by the Emperor Ferdinand III, and in France by the Queen, wife of Louis XIV. He paid special attention to the communities in France and Savoy which had never been visited since their foundation. He promoted the studies, zeal for regular discipline, and governed with meekness and dignity. It was very pleasant to be in his company with his sweetness, religious spirit and courtesy. At the same time he was able to promote a deep respect. Of great edification very the last moments of his life. He received with serenity the news of his upcoming death, he blessed the Lord, and when the Viaticum was brought to him he received the Holy Eucharist with sighs of deep fervor. Having received the Anointing he died in the Lord on February 17, 1672, in St. Charles. The historian Father Colombo wrote: “A great theologian and excellent canonist, he was selected by the Bishop of Vercelli, Francis Bonomi, as his companion, and was sent to Switzerland by the Holy See as a Nuncio. Then the Bishop sent him to Rome to give a report to the Pope about the local situation, but especially to try to destroy all the calumnies with which he had already been saddened by some miserable men. Through his mediation Bishop Bonomi regained the good grace of the Holy Father. As a consequence he received the delicate and dangerous mission to notify the Archbishop of Cologne, Ettore Truchez, that he had been deposed, since he was unfaithful to the Church and to the Emperor. Truchez was succeeded by Ernest of Baveria. Fr. Boerio partook in this success, again as a com­panion of Bishop Bonomi, and received precious congratula­tions from the Emperor, Rodolph II and from Gregory XIII. He had more success in a similar mission in Poschiavo, but there too the non-catholics turned to violence to eliminate him. The Catholics had to rescue him from the enemy army. Finally St. Charles decided to pull him out of that mission. “This Barnabite from Tortona was also Superior and covered different offices. Of very strict cos­tumes: well grounded in true piety; strong and magnanimous in character, he would gain new strength from opposition and fights: very able in unveiling frauds by the enemy of the faith: daring but prudent and discreet; he not only loved tenderly his religion, but studied it to the most possible comprehension.” Fr. Colombo failed to mention that he was entrusted by Clement VIII to reform the Cistercian Monks in the Abbey of St. Mary’s in Stafarda. At the age of 53, on February 20, 1601, he died in the Lord, while he was Procurator General. Father Spotorno was born in Liguria in 1788. He did his studies in our school in Finale, and when he was 15 he asked to be admitted in our Congregation. After his novitiate in San Severino he went to Macerata for philosophy and to Rome for Theology. Gifted from God with rare intelligence and powerful memory, he dedicated himself with passion to the study of all sciences. During the Napoleonic suppression he went back to Liguria where he was ordained a priest. He stayed there as the guest of Bishop Moggiolo to teach the youth. With the fall of Napoleon the Congregation was reorganized and Fr. Spotorno went to Bologna ready to follow the instructions of the superiors. He taught there for two years, then in Livorno and back to Bologna, a city rich with scholars. There, he was able to satisfy his thirst for a deeper knowledge, especially classic literature. That is when he started to write poems. When in 1818 St. Bartholomew of the Armenians in Genoa was given back to the Congregation, Fr. Spotorno was transferred there and became a well appreciated preacher. At that time there was a controversy in Genoa about Christopher Columbus’ birthplace. Fr, Spotorno made an extensive research and study of all opinions and documents available, and proved beyond any doubt that Genoa was indeed Columbus’ birthplace. The city was very grateful to him and the magistrate nominated him president of the public schools and of the city library. Involved now in public schools, Fr. Spotorno, availing himself especially of the city clergy, did reform the system introducing good manners versus the prevailing baroque style of the time, and love for the classics. It was at this time that he had the idea to write a literary history of Liguria. As part of this work he was entrusted with the translation from Spanish of the Columbus Codex held in the city Archives. A man of great versatility and dedicated to the promotion of classical studies, he translated some of the most precious verses from Greek, Hebrew, Latin, French, Provencal and Spanish. When the Latin chair at the University of Genoa became vacant, he was the unanimous choice. Many were his accomplishments and contributions to the field of knowledge through his teaching, re­search, and publications. He died on February 22, 1844, and was buried in St. Bartholomew, in Genoa. James Marin, son of Claude Marin, “a gentlemen and fiscal Procurator of his Highness,” in the Duchy of Chablais, and of Frances Ducrost, was one of the first members of the Congregation from Savoy. He studied philosophy in Chanbery with the Jesuits, and Law in Dole, Burgundy. When in 1618 the Barnabites opened the novitiate in Thonon, he was one of the first three novices, and professed his vows in May of 1620. He studied theology in Pavia where he was ordained a priest, and his first assignments were in Annecy and in Paris. In 1624 Fr. Giusto Guerin took Fr. Marin as his helper to work for the canonization of St. Francis de Sales. They both worked tirelessly for this cause, traveling all over Savoy and France and to Rome, until finally in 1617 Alexander VII beatified him. Another achievement of them was the opening of a new house in Paris, of which Fr. Marin was one of the first Superiors. In 1638 he was elected Provincial Superior of France and Savoy with residence at St. Eligius in Paris. He kept an epistolary correspondence with St. Frances de Chantal and St. Vincent de Paul. Fr. Marin was “one of the first friends of the Visitation.” He wrote the “Life of the Blessed Mary of the Incarnation,” foundress of the discalced Carmelite nuns in France. Father Besozzi was a man ahead of his time who was able to give a new impulse to the studies in our Congregation enabling it to face the new ideas of those new times. Born in Besozzo, in 1708, John Peter was pursuing a law career in the midst of worldly pleasures when at the age of thirty, touched by the grace of God, asked admission to our Congregation. He went to Monza for the novitiate and professed his vows on October 15, 1737. After ordination he was assigned at first to teach philosophy at the Arcimboldi school in Milan, then theology at the diocesan seminaries of Bologna, Pavia and Rome. Because of his fame Benedict XIV made him a member of the ecclesiastical Academy. Fr. Besozzi fought with vigor any kind of decadence in philosophy and literature, and he was the first to introduce in our Congregation the study of mathematics, which up to then was the monopoly of private schools. He pursued such innovation with greater vigor when he was elected Superior of St. Alexander in Milan and then Provincial Superior of Lombardy. After one year as Provincial Superior, Fr. Besozzi was elected Superior General. Right away he made an appeal to Charles Emmanuel III, King of Sardinia, to protect the revenues of our school of Thonon in Savoy. As soon as he solved this crisis he had to run to Naples where the Minister of the Royal Court, being of Jansenistic tendencies, was introducing all kinds of antireligious reforms. Then he was in Rome to obtain many favors for our Congregation, and especially for our house in Rome which was freed of a debt of 3000 scuds. He enriched the library in St. Alexander in Milan with many books of philosophy and theology, plus he had many other programs in his hands when he was hit by asthma and after a short illness died in St. Charles, on February 23, 1768. 2) Fr. Peter who professed his vows in 1672, teacher in St. Alexander, pastor and superior in Piacenza, Superior and vicar in Montù, where he died on August 30, 1720.
receive the habit from St. Anthony M. Zaccaria. Father Girardin was born in Namours on March 28, 1866, from Adame Alexis and Lucille Anne Dutoit. In the September of 1879, he entered our seminary in Mombricon, near Gien. With the decree of 1880 the Congregation lost everything in France. Thirteen students were so attached to the Congregation that they asked their parents to follow the Fathers in exile. One of them was Maurice Girardin, who with Fr. Albert Dubois went to Genoa in December of 1880. Shortly after, he joined a group of Italian and French seminarians to open a new seminary in Cremona. In 1882 he was ready for the novitiate which took place in San Felice a Cancello. The Father Master was Fr. Maniolil, who was a real father for the nine novices, all of them victim of the persecu­tion. After his profession he went to Rome to study Philosophy at the Apollinare, and then theology. During this time he went back to France for a visit at the request of his parents. He was ordained to the priesthood on August 5, 1889, in St. Mary’s Campitelli. Assigned to Gien he stayed in Paris for further studies. In 1890 he received the “Bachelier en-sciences” and pursued further studies in physics and chemistry for two more years. From 1892-1902 he taught in Gien. In 1903 the school was closed by the government, so he moved to Mouscron and then to Kain where, in 1905, he was also Superior. On October 1, 1906, he was elected Superior and Master of the Mouscron novitiate. On October 4, 1908, he was assigned to the newly founded college of St. Anthony M. Zaccaria in Brazil. There he spent the last years of his life. Consumed by his zeal in the school and in the apostolate, he died on February 27, 1918. He was totally and completely absorbed in his studies especially physics, and with great interest he was following the development of religious problems in relation to science. Preaching was one of his favorite subjects, but when asked to teach he applied himself using all his mathematical skills. He did not shy away from the confessional although his mathematical mind some­times caused him trouble. Father Maletta distinguished himself for his efforts in the reform the Order of the Umiliati in Cremona. He was a close friend of St. Charles Borromeo, St. Philip Neri, Bishop Sfondrati, and Maximilian II Stampa. In 1569 he was the first Superior of St. Vincent in Cremona. There he created a society of charity for the assistance to those in need. He was also the founder of our house in Casalmonferrato where he established classes for Christian doctrine. In Rome he was to receive the first novice of that city, he was Procurator General, and one of the founders of the novitiate in Zagarolo. Pope Gregory XIII sent him, together with Fr. Marchesi, to Malta to reform the Order of the Knights of Jerusalem. The two took off from Rome on November 4, 1581, but they were forced to stay for three with the Theatines in Naples before they could reach the island. Their work was very fruitful and their reform was successful in a short time, and Hugo de Leubens de La Vedale, a Guascone loved by the Pope, was elected as Grand Master. He wanted to keep the Fathers in Malta, but after one year Fr. Maletta went back to Rome, and a year later Fr. Marchesi to Milan. Back in Rome, Fr. Maletta got sick. Sent to Milan, he was elected Superior of St. Barnabas. He kept working tirelessly and one day, sent by St. Charles Borromeo to a village near Varese, he collapsed. He died on February 29, 1584, only 55 years old.